This is a coloring book of 47 prayer inspired designs. The prayers are mostly Christian in nature but there are also some included from other religions. The designs are very pretty but do not generally reflect the words of the prayer. The words themselves are part of the design and are meant to be colored. In some cases, the words are, in fact, the design. The designs are quite detailed and in some spots, intricate and small to color. Some of the prayers are attributed to their original source. Designs printed on one side of the page with the prayer attribution, if included, printed on the design page. Some designs merge past the perforations into the binding area. Nothing essential to the design will be lost if you remove a page from the book. Opens fairly flat for ease of coloring. Alcohol-based markers bleed through the page. If you use this medium, I suggest using a blotter page to keep ink from seeping through. I use card stock but a couple of pages of paper should work as well. Water-based markers, India ink pens and gel pens do not bleed through the page. Some do leave light, colorful shadows on the back of the page. Colored pencils worked well with this paper. I tested both oil and wax based pencils and found that I was able to apply layers of the same color to get rich pigment. I could also layer multiple colors well and I could blend both oil and wax based pencils easily with a pencil style blending stick. This is the first book I have read by Leslie Nagel. 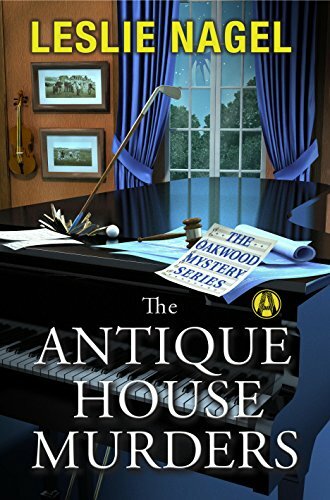 It is, however, the second book in the Oakwood Mystery series. While I found it easy to dive into and read as a stand-alone book, there were enough clues given in this book about the previous one that it was a bit of a spoiler. If the idea of the series is interesting to you, you might want to consider starting with the first book and reading them in order. Charley Carpenter is the owner of Old Hat, a vintage clothing store. She is also the girl friend of the town detective, Marc Trenault. She is also a very inquisitive and bold in action woman. When one of her oldest friends and mentors is found murdered, she can’t rest until the murderer is brought to justice. This is a Charles Santore coloring book published by Pomegranate. It is a mix of various fairy tales and story books, including some designs which are included in his coloring books on a specific title, such as Snow White and Aesop’s Fables. Some of the pictures have darker shading than others and most have elements of grayscale coloring rather than simple line drawings. I treat them as if I were working on a full grayscale design by laying down a foundation of color using alcohol-based markers. Once that I am done with that layer, the gray shading became the shading in my colors. I then add colored pencil details and highlights. The designs are really elegantly drawn with fine details from the original artwork. Thumbnails of the original watercolors of each design are printed in glossy prints on the inside of the front and back covers. I appreciate this touch as at times I need to look at the pictures to determine which part of the design I was coloring. You can follow the colors in the picture or, as I do, use my own color palette. If I use markers while coloring in this book, I use a blotter of card stock or heavy weight paper below my working page. It keeps seeping ink from marring the design on the page below. Colored pencils work well with the paper. It has a slight roughness to it that allows good pigment coverage from both oil and wax based pencils. I was able to layer and blend easily with both as well. This is a lovely coloring book of Victorian fairies. The designs are based on famous artwork and have been adapted into line drawings by Marty Noble. The designs are all quite elegant and have full backgrounds. They are detailed and some have intricate and small areas to color. While I wish that the book was printed on only one side of each page, I really like that the original artwork is attributed (though it might have been nice if that was done on a single page rather than at the bottom of each page.) I also like that there are full color thumbnails of each of the original artworks. Those are situated at the inside of the front and back cover. This is what I experienced while coloring in this book and testing it with my coloring medium. Designs stop well before the binding area and can be removed in whole from the book by removing the three staples at the binding. Each of the designs has a framing line at the outer edges. Gel pens and India ink pens leave colorful shadows on the back of the page. India ink pens can bleed through in spots if you apply heavily or use multiple coats. Colored pencils worked well with this paper. Both oil and wax-based pencils provided good pigment, layered well with the same or multiple colors and blended well using a blending stick. Hard lead pencils did not dent through the page. If you choose to use any medium other than colored pencils on the pages of this book, you will probably find bleed through or colorful shadows on the design at the back of your working page. I own a couple of coloring books by Amy Brown which feature faeries. In this coloring book, the focus is on dragons. While this is one of her newer books (published 2015) I was really pleased to see that others of her older and out of print books are being re-printed once again. 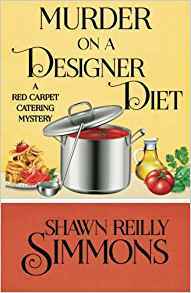 This is the third book in the Red Carpet Catering mystery series. The series sleuth is a caterer for movie and television sets. It’s an interesting twist in the cozy mystery genre and provides a peek into the backstage of making movies, etc. Penelope Sutherland is the owner and catering chef of Red Carpet Catering. She and her crew have taken a short job on an Indy film in New York City. The hours are difficult and sporadic as some days (or nights rather) they work until dawn. This is an older Dover coloring book, Angels by Marty Noble. As with other Dover published coloring books (as opposed to the Creative Haven line by Dover), these designs are printed on both sides of the page. The angels designs in this coloring book are both graceful and elegant. They are all female I would have loved to see a few male angels, such as Gabriel and Michael portrayed by Ms. Noble. Some of the designs are reminiscent of famous works of art and may have been inspired by them. However, there is no attribution stating so. The designs are all of angels in a variety of detailed backgrounds. They are well centered on the page with a framing line at the outer edges. The designs are detailed and, while a few of them include some intricate elements, the designs are not what I consider intricate with masses of small and difficult elements to color. Designs stop well before the binding area and can be removed in whole from the book by removing the three staples at the binding. This is a beautifully drawn book of 31 mythological creatures. The publishing of the book is also well done. The range of creatures included is fairly extensive and, at the end of this review, I will provide a full list of the mythological creatures included. The creatures represent myths and stories from a wide variety of cultures. The initial line drawings are realistically portrayed but then the inside of the mythological creatures are many doodle style intricate elements. The designs are detailed and highly intricate with many small and hard to color details. It may not be the best book for those who have vision or fine motor skill issues. The attached cover is beautifully illustrated with coloring and light touches of purple and blue metallic foil on the front artwork. The paper that is used for this book is a very good quality and would work well if you wish to frame your finished work. Slight elements of the background design are already colored. While my personal preference would have been to have left these blank, I am okay with the small amount they have colored in this instance. The designs do merge into the binding and you will lose portions of some of the designs if you remove a page at the perforations but nothing essential to the integrity of the design. Paper is white, heavy weight slightly rough, has background elements slightly pre-colored and is perforated. Most designs merge past the perforations and into the binding area; however, these portions are not integral to the overall design. India ink left shadows on the back of the page. Gel pens did not bleed through and did not require extra drying time. Coloring pencils worked well. Both oil and wax based pencils worked well for providing good pigment. I was able to layer the same color for deeper tones, layer multiple colors and to blend easily using a pencil style blending stick. If you use a wet medium with this book, I suggest using a blotter page of card stock or several sheets of paper to keep ink from seeping through the ruining the pages below. You can also simply remove a page from the book before coloring as well. Designs in this book include: Minotaur, European Dragon, Jackalope, Basilisk, Gorgon, Cockatrice, Yeti, Pegasus, Ogre, Kraken, Gnome, Hydra, Harpy, Qilin, Kitsune, Unicorn, White Stag, Sphinx, Goblin, Griffon, Faun, Phoenix, Chinese Dragon, Mermaid, Troll, Werewolf, Fairy, Manticore, Centaur, Sea Serpent and Cerberus. I really enjoy coloring doodle creature designs. I have some that are elegant and some that are a tad bizarre but up until now, I’ve never seen so many designs that are simply so fun and cute. The designs in this coloring book feature dinosaurs in a myriad of unlikely situations. They range from dinosaurs who walk the earth, fly in the sky or swim in the deep. The designs feature both small and large dinosaurs along with lots of other doodle elements and creatures. The designs are detailed but not what I consider intricate and difficult to color. What I like about these styles of designs is the freedom to use whatever colors you wish to emphasize (or the reverse) the elements that speak to you. Coloring Pencils work well with this paper. I found that I could layers the same color for deeper pigment or multiple colors and I could blend easily using a blending stick; however, some of the darker and thicker lines of the designs had a tendency to smear using this type of blender. I found that liquid forms (Gamsol or mineral spirits) did a better job with these particular designs. I tested both oil and wax based pencils. I also found that hard lead pencils (like Verithins) leave dents through the paper. I have read all of the books in The Country Club Murders series and have enjoyed each and every one. 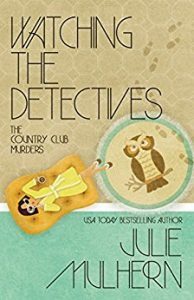 Julie Mulhern places her sleuth in humorous situations and has a knack for dialog which makes her characters come alive. In “Watching the Detectives”, the humor is still evident but a serious issue is addressed and it is done in a very serious way. To say more about the issue would be somewhat of a spoiler, so I won’t do so. Ellison Randall seems to be a magnet for finding dead people. The entire town is beginning to talk about it. Really, she almost seems to trip over them. 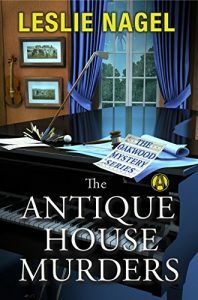 That the murders take on the aspect of a Clue game right in her own home is making her a bit leery of being at home with teenage daughter Grace.